Harold…It’s time to get out of Dodge! I’m about ready to take a firearm to Mr. Harold Headbanger and I don’t even know how to use one….yet! You’ll recall from a previous post that a beautiful, male, Northern Cardinal has taken up residence in my yard. I was so smitten with him that I gave him a name. At first I was mesmerized by his brilliant red color and his beautiful song. I’d sit outside on my back patio in the frigid cold for as long as I could stand it, watching him flit from tree to tree around the yard listening to his happy, soul-mate searching song. On a grey winter’s day this was my entertainment (you can see that there isn’t a lot to do in middle-earth!). Me: I’d like to get a new rug for my family room. Middle-earthling: Oh, you mean your “keeping” room? Me (as I grit my teeth…sophomoric, I know): No…the family room. Even “great room” is a better term (and I often use it) than “keeping room”. And for inquiring minds, apparently the term “keeping room” dates back to Colonial times when the entire family would sleep in that area– just off the kitchen– as the rest of the house was often very cold. Since the keeping room area could be heated by the kitchen stove or fireplace, it often provided the only heated place in the house. As I was saying, Mr. Harold Headbanger is getting on my nerves in a big way. In fact, I’d like for him to leave…as in “Get outta Dodge” as the saying goes..because I’m coming THIS close to making things mighty uncomfortable for you! Go Harold…and today isn’t soon enough! Either that or find a pretty little mate and move on. OK, so females do look a bit drab Harold, but get over it! Fly off into the sunset …or to another house down the street….and live out your Cardinal days together….Just PLEASE not in my yard. Why on earth do I want to rid my yard of such a beautiful bird? The head-butting, body slamming behavior that goes on repeatedly is making the poodle go mad. Poodle is constantly barking. He sees Mr. Harold Headbanger clinging to the screen on one window and he goes nuts. Then moments later Harold has moved to another window that doesn’t have a screen which means he can easily perch on the sill and peck away on the glass. Tap, Tap, Tap…in syncopated rhythm Harold goes, attacking his would-be nemesis. This causes the poodle to go absolutely bananas, barking like crazy and jumping up to reach the window. And….this quite naturally turns me into a purple minion, á la Despicable 2, the movie. 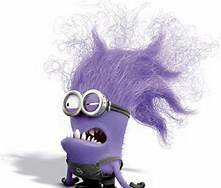 My sis was the first to tell me about the purple minion “phenomenon” saying it was an “absolute must” to see the movie. This was not a problem for me; any time spent with my adorable nephew is a delightful treat. After I saw the movie with Alexandre-the-Greatest I understood what my sis was saying! There are just some days that no matter how hard I try to use a calming, mindful breath in a difficult or unpleasant situation, in a flash I can turn from calm, cool and collected Cristina into a screeching, demonic purple little monster. There is no pride in this people….it just is. I’m half-Italian…it’s my only defense! And yes, the journey towards greater enlightenment continues! Of course folks… there is a solution other than resorting to any violence on my part. I don’t need a firearm to get rid of the problem. I can simply pull the window shades down and voilà, no more head butts to the window. All is calm. Poodle is tranquil and so am I. The problem is now the rooms are darker, not a lot mind you, but enough to make me feel closed-in, almost claustrophobic, in my home. I have these large, lovely windows and with the shades pulled down I cannot see out into the yard and admire the sun and, like this morning, the beautiful blue sky…nor can I keep track of poodle when he’s out. I wonder just how long Mr. Harold Headbanger plans on staying. Isn’t he going to move on at some point so that I can let the light back in? Well, you can imagine the Middle-Earth headlines, I’m sure…..
As you are writing, a Cardinal smashed into my window but these do it because they do not see the window. Yours is another matter. My suggestion is to go get a couple of those child’s mylar windmill toys, get a suction cup thingy with a hook, place toy windmill outside on window. It should distract the poor guy! What a great idea! You’ve quite possibly saved a life…or two! I’ll let you know how it works!